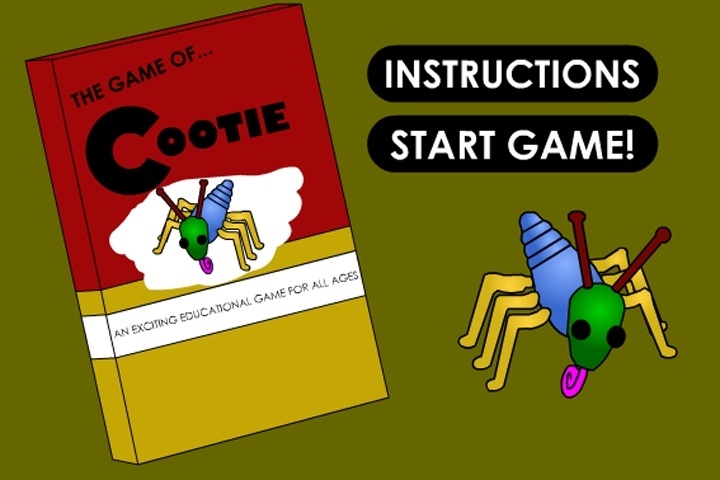 Object of the game is for each player to construct his or her own 'cootie' first. Roll the dice see if you match up to put parts on your weird looking bug. Number 1 on the die represents the body. Number 2 on the die represents the head. Number 3 on the die represents the antenna (feelers). Number 4 on the die represents the eye. Number 5 on the die represents the proboscis (mouth). To begin the game, each player rolls the die once. The one with the high score starts the game. If you want to play Cootie games online you have come to the right place! GamesLoon adds new Cootie games every week. This is your game portal where you can find the biggest collection of free Cootie games online. Do not forget to rate our Cootie free online games while playing!